This cutter was located at a Hospital In-Plant facility. It was used very little, and maintained meticulously on a service contract. The machine is fully functional and will be an excellent addition wherever it goes. PLEASE NOTE: Many Challenge cutters are subject to a Service Bulletin regarding their Hydraulic Systems. This cutter is not affected, as it has the Newer-Style hydraulic pump. 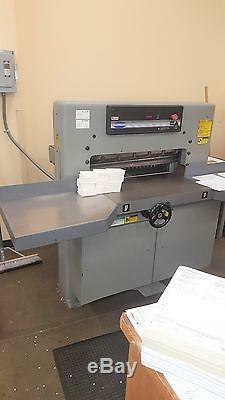 1995 Challenge 305MC paper cutter. Hand wheel for backguage movement. If you have questions on the machine or loading, please contact me. Machine will fit on a 5' X 5' skid and we will secure with blocking & straps. 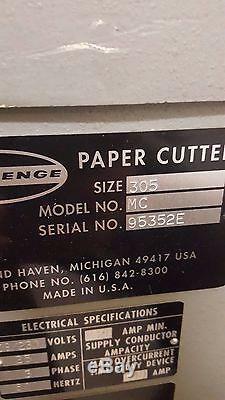 The item "1995 Challenge 305MC paper cutter" is in sale since Saturday, May 06, 2017. 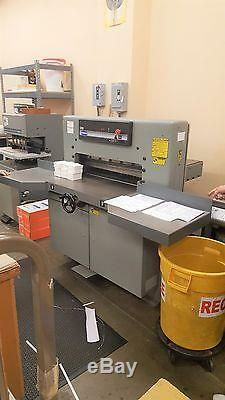 This item is in the category "Business & Industrial\Printing & Graphic Arts\Bindery & Finishing Equipment\Paper Cutters & Trimmers".e" and is located in Salem, Oregon. This item can be shipped to United States.